Random House Trade Paperbacks, 9780679783473, 240pp. “You’ve reached the age at which people in this family cross the border into the magical world. 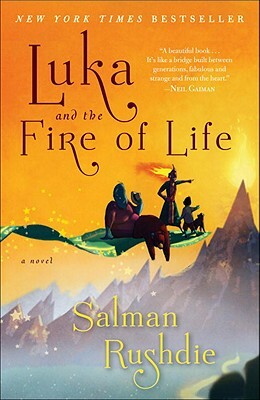 It’s your turn for an adventure—yes, it’s finally here!” So says Haroun to his younger brother, twelve-year-old Luka. The adventure begins one beautiful starry night in the land of Alifbay, when Luka’s father, Rashid, falls suddenly into a sleep so deep that nothing and no one can rouse him. To save him from slipping away entirely, Luka embarks on a journey through the world of magic with his loyal companions, Bear, the dog, and Dog, the bear. Together they encounter a slew of fantastical creatures, strange allies, and challenging obstacles along the way—all in the hope of stealing the Fire of Life, a seemingly impossible and exceedingly treacherous task. Salman Rushdie is the author of ten previous novels—Grimus, Midnight’s Children (for which he won the Booker Prize and, recently, the Booker of all Bookers), Shame, The Satanic Verses, Haroun and the Sea of Stories, The Moor’s Last Sigh, The Ground Beneath Her Feet, Fury, Shalimar the Clown, and The Enchantress of Florence—and one collection of short stories, East, West. He has also published three works of nonfiction—The Jaguar Smile, Imaginary Homelands: Essays and Criticism 1981-1991, and Step Across This Line—and co-edited two anthologies, Mirrorwork and Best American Short Stories 2008. He is a former president of American PEN.